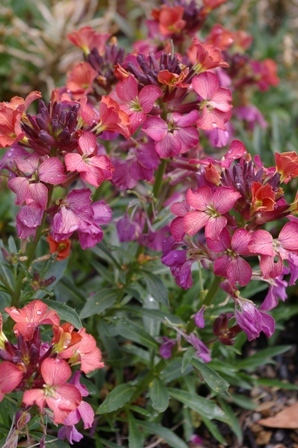 Joy Creek Photo Archive (c) all rights reserved Erysimum 'Wenlock Beauty' is a mounding evergreen shrub with clusters of unusually colored mauve and yellow-brown flowers in spring. What we enjoy about this shrub is its willingness to repeat bloom lightly later in the season, the bronze cast of its tight buds and the way the gray green leaves complement the flowers. Early spring to early summer. 18 in. x 18 in.